Memorial, along the eastside of I-71 to a fallen trooper. 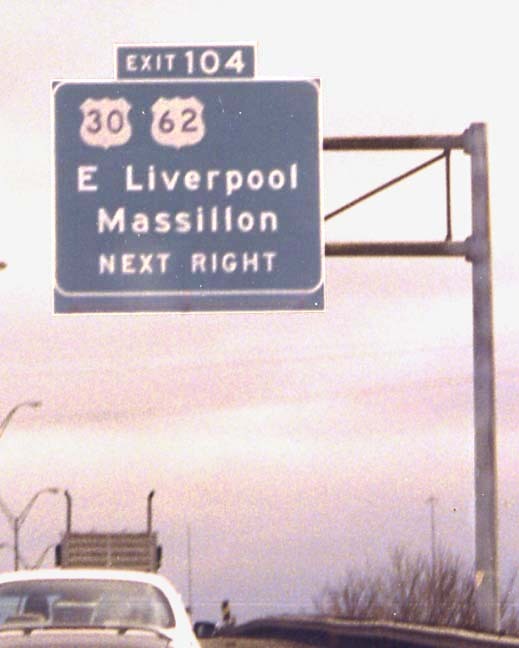 I-71 is named in his honor through here. 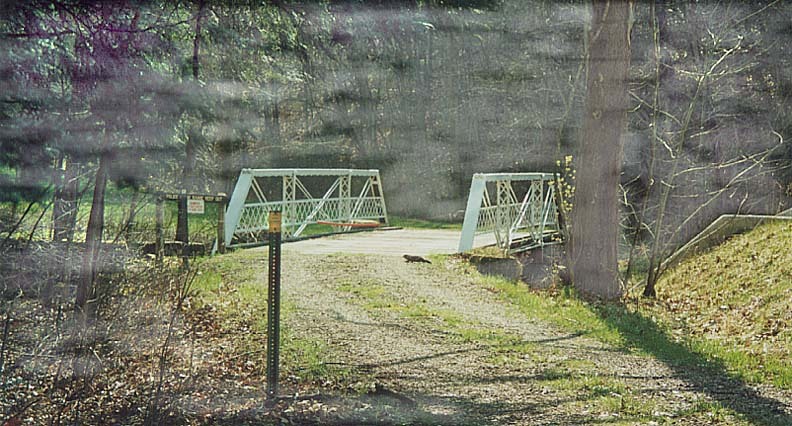 This path leads to a police shooting range, I don't know if this was a former routing for the road to the right. 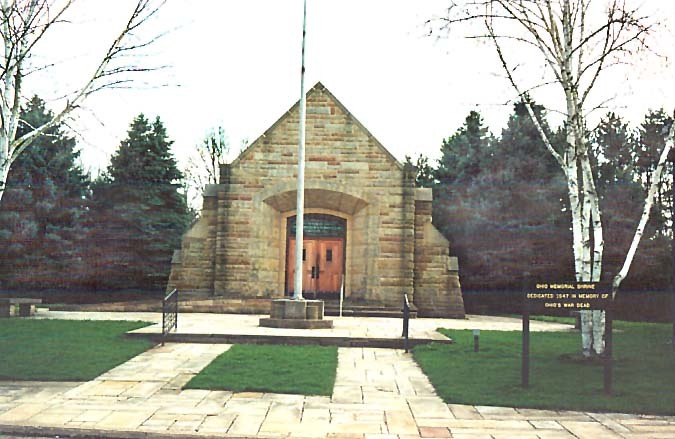 Memorial Shrine Dedicated to those who have given the greatest sacrifice for our country. 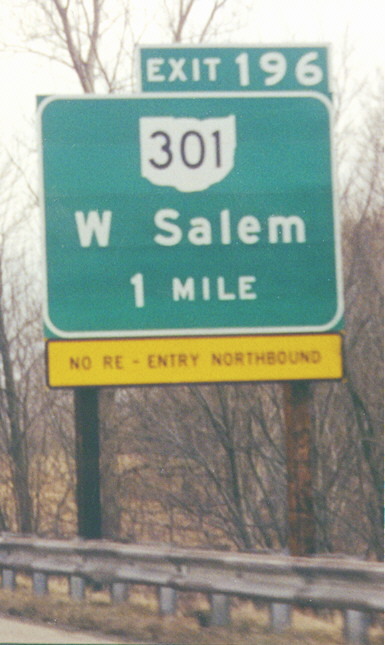 Incomplete interchanges are not common in rural areas, and neither are supplemental signs informing travellers that there is no re-entry, especially in this color scheme. 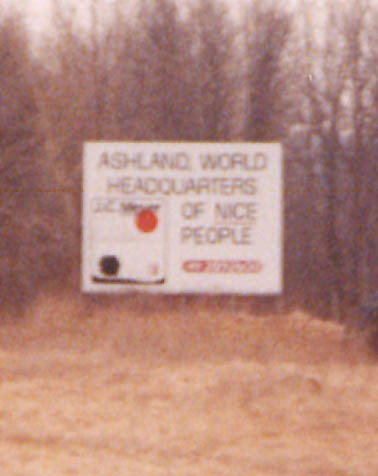 (This supplemental sign is a recent replacement; the former supplemental sign did have the more conventional colors and font). On Interstate 71 Southbound. At some point along Oh 3 in Southern Wayne Co, the trees open up and you can see all the way to Wheeling (well not quite)! Closer to the truth is that this is a huge expanse of Holmes County. Pleasant to the eyes. The freeway/expressway carrying US 62 east from Canton continues to Ohio 225 north of Alliance where it abruptly ends. 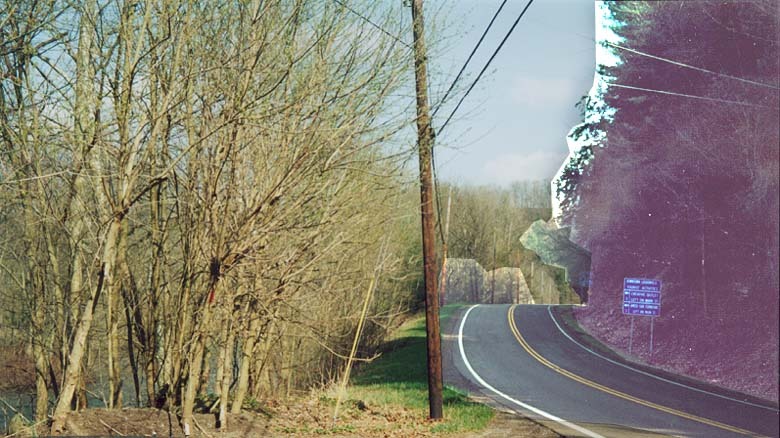 Plans show it as part of a proposed highway also incorporating the existing northern bypass of Salem (in part US 62 and Ohio 45) and continuing to the Pennsylvania state line where it would connect with the four-lane-divided PA 51. US 62 currently leaves the western segment of the existing highway at the Ohio 173 interchange west of Alliance, and the highway continues unnumbered (although ODOT calls it "US 62 Future" and "US 62 T" in its records -- see this page). 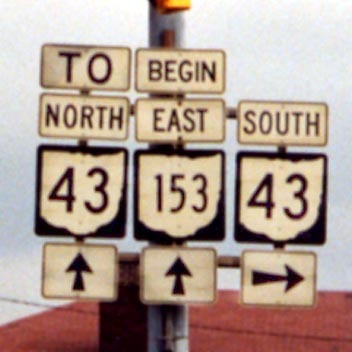 To assist motorists, it is signed as [TO][NORTH][Ohio 225] going east and [TO][WEST][US 62] going west. 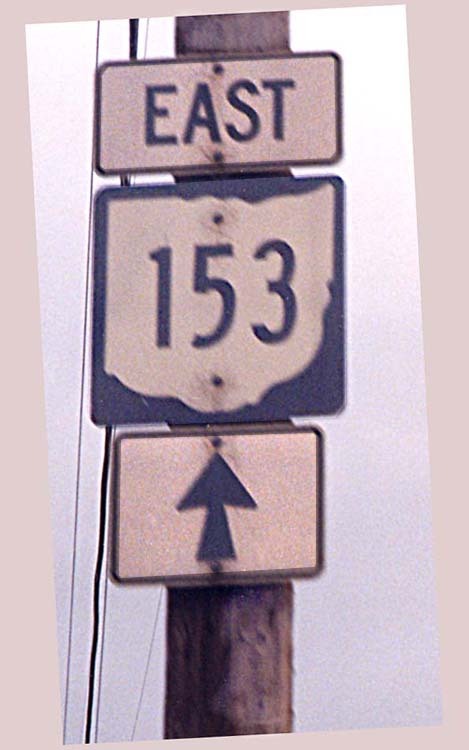 The unsigned portion of the eastern (Salem) segment (between Ohio 14 and US 62/Ohio 45) is signed as [TO][EAST][US 62] and [TO][NORTH][Ohio 45] going east and [TO][WEST][Ohio 14] going west (officially called "Ohio 14 Future"/"Ohio 14 F" -- see this page and this page). West end of the Alliance segment. Ohio 225 doesn't actually go to Ravenna. The highway right-of-way ends immediately east of the Ohio 225 overpass at the woods in the photo -- there is no visible sign whatsoever of future expansion beyond that point. This sign on Ohio 225 Northbound approaching the east end of the Alliance segment is consistent with the signage on the freeway westbound, but doesn't actually make logical sense. Sandor has always disliked small shields for 3 digit routes. 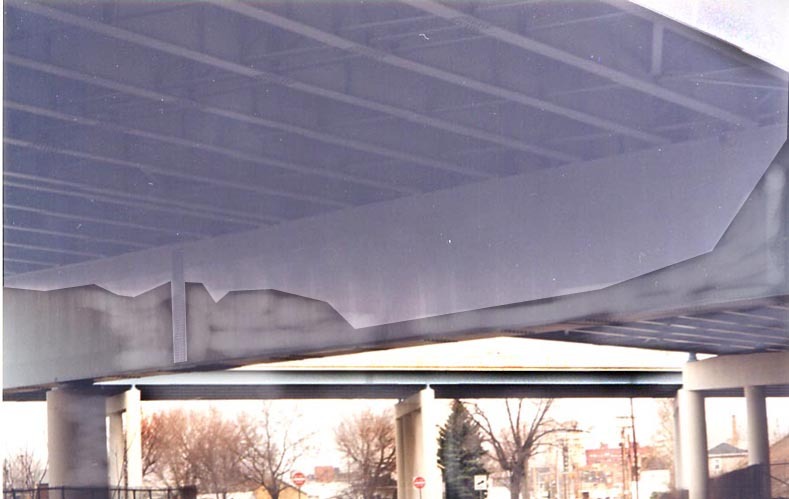 This one is just beyond the Ohio 43 street pair (from above). Ohio 43 Southbound follows Walnut Avenue NE when Walnut splits from Market Avenue N. Because Walnut is one-way southbound, there is no interference between Walnut and Market N Southbound, so through traffic gets continuous green through arrows (the word at the top of the sign on the right is "CONTINUOUS"), and therefore the yellow through arrow is not needed in the doghouse signal. This is Canton's largest and most complicated interchange (map). 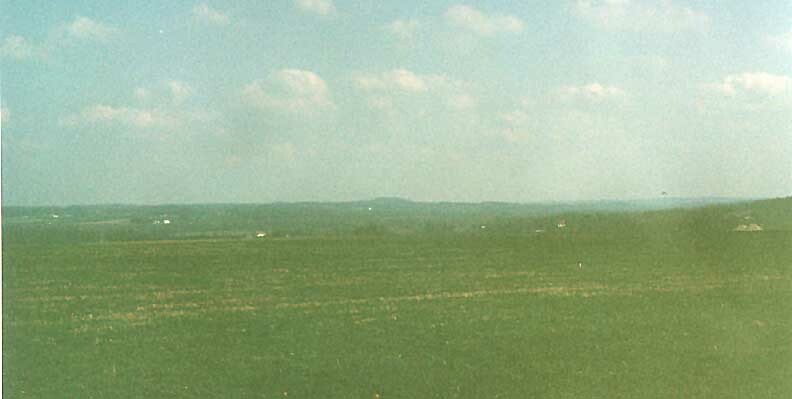 It is mostly elevated over features that predate it. The signs for the US 30/US 62 ramp on I-77 Southbound have a space which could accomodate another route marker. This is where two-way Cleveland Avenue splits into one-way-northbound Cleveland Avenue and one-way-southbound McKinley Avenue (this all used to be Ohio 8). 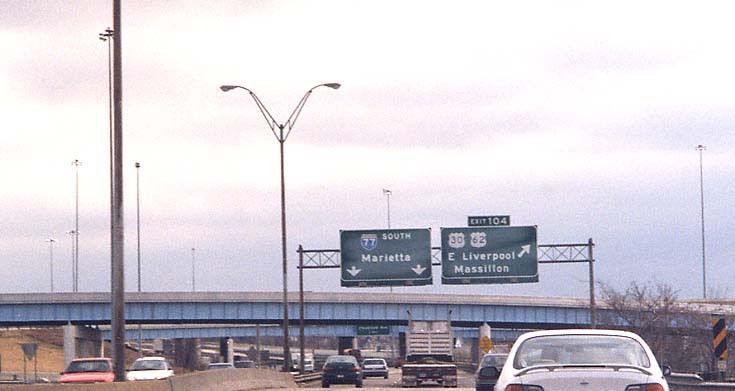 The large bridge in the foreground is the US 30 freeway and the smaller one behind it carries the ramp from US 30 Westbound to both directions of I-77. It appears the "south" direction sign has popped off the Oh 9 Shield. Included is a rickity old RR bridge over said highway. US 30 Information Site - This page covers the plans to upgrade US 30 between East Canton and the Ohio 11 freeway north of East Liverpool.